The first time I tried cranberries as a child was straight from a can in that common gelatinous form. Granted, I wasn't a fan since it's not exactly an ingredient common in asian cuisine I grew up on. But later as an adult when I tried cranberry sauce made from scratch using fresh cranberries, my tastebuds perked up and I loved it! Before I knew it, I started looking for ways to use cranberries either fresh or dried. Now, dried cranberries are a staple in my pantry especially during the holidays and the peak of my baking season. 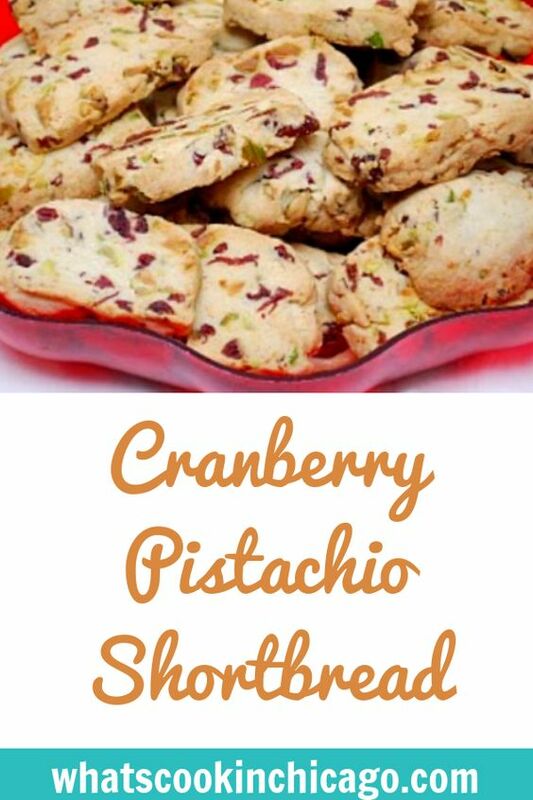 There's something about cranberry that says 'holidays' to me... and these shortbread cookies captures the sweet taste of the holidays too. My friend Frances made these cookies for my holiday cookie exchange this year and they were a hit! 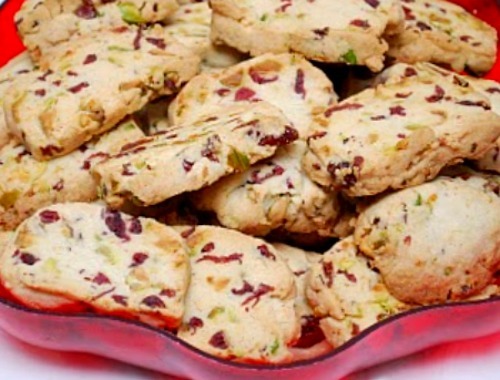 Aside from the beautiful red and green tones mixed into this cookie, the combination of cranberries and pistachios are delicious together. Preheat oven to 325 degrees F with the rack in the center of the oven. Using a thin bladed knife, slice the logs into 1/4 to 1/2 inch thick cookies. Place the cookies on the prepared baking sheet, spacing about 2 inches apart. Bake for about 15 - 20 minutes, or until the cookies are just beginning to brown around the edges. Remove from oven and cool on a wire rack. FYI, this recipe was published in The Grand Central Baking Book by Piper Davis and Ellen Jackson. Since it's copyrighted material, might want to mention it's source. Thank you for the information! My friend Frances wasn't able to give me the details of where she got the recipe but I'm so glad that you've provided it. I've updated the post to cite the source appropriately. I made these cookies with orange zest then iced them with an orange zest glaze. While the cookies are already good, it added a citrusy punch. I love them!